AirSculpture are one of the UK's longer-running EM outfits, bearing strong comparison with r.m.i., amongst others. It seems that most of their catalogue features sampled Mellotron, but going by the pic in the insert of Burn (recorded 2002, released 2008), they owned a real machine, at least for a while. Like the rest of their output, the album consists of lengthy, fully improvised Tangerine Dream-esque synth explorations, not least the ubiquitous, near-obligatory modular machine, without which most 'authentic' EM bands appear quite emasculated, with particularly good sequencer manipulation on Stage Four, speeding up in a 'can't do this with a digital one' way. 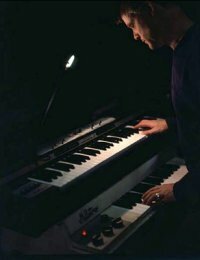 Adrian Beasley is credited with 'real and virtual Mellotrons', making it difficult to work out what's playing what, unsurprisingly. However, there's so little of either that you wonder why he bothered with the 'virtual', with occasional flute and string parts on Stages One and Two and heavily phased flutes on Stage Four. The liner notes say, "Sadly, the 2002 performance was the time that we said goodbye to Adrian's Mellotron", although I've no idea why he sold it, or whether it can be heard on any other AirSculpture album. Perhaps you could let me know, chaps? Anyway, another solid EM album; genre fans will love it, everyone else will look bemused, or wander off, muttering to themselves. Incidentally, Adrian tells me that he owned his machine for fifteen years, but only used it one other time with AirSculpture, at a Jodrell Bank set in 1997. According to their website, "The magic 'Tron moment comes, he hides in his headphones, tunes up, then begins to play. Out of tune. Back to the phones and back in tune. Play... yup, out of tune again. The 'Tron becomes a very heavy computer stand." They add... "We have a DAT recording of the concert. We have no plans to release it." All things considered, I can't say I blame them. In fact, I'm quite amazed they had the nerve to have another go... After Adrian sold it, it made its way to Brendan Pollard, who has subsequently sold it on again, to person or persons currently unknown. 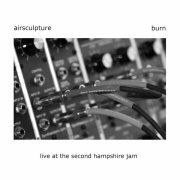 AirSculpture are a British 'Berlin School' EM trio (and onetime Mellotron owners), whose work, like that of (presumably) friendly rivals r.m.i., is largely based around improvisation, analogue sequencers reprogrammed on the fly to keep the music dynamic. I believe 1997's Europa (recorded at that year's Alpha-Centauri festival in Amsterdam) is their third album 'proper', a fluid set of fairly typical EM including two twenty minute-plus tracks, containing all the usual features. The band's (presumed) samplotron use is low compared to other similar outfits, with choir and strings during the second half of Europa Part 1, flutes in the latter half of the lengthy Part 3 and more choirs in Part 5. Their next release, the following year's Thunderhead, is a studio recording, consisting of improv pieces 'with some minor overdubs and editing', which sounds like a sensible way to tackle this very singular genre. It seems to concentrate more on rhythm than its predecessor, although one track (Pogofish) eschews the sequencers completely. The album's only (again presumed) samplotron use is a flute part a few minutes into the half-hour title track, with sporadic reiterations throughout, plus choirs about halfway through. From some years later, 2005's double-disc TranceAtlantic shows us another side of AirSculpture, as Walk The Locust and the disc-long title track both open with some highly competent piano work, proving that the band aren't merely your common-or-garden modular synth jockeys, while the full-on train sound effect madness in Walk The Locust Part 2 shows an inventive side to the band missing from many of their contemporaries. Not a great deal of samplotron, but the trio seem to ration it out carefully. 2006's Before the Moon, documenting their set from La Gomera, seems to be available in two different versions; I believe the two-disc one-track-per-disc one is the original release. Part 1 is pretty much what you'd expect, but somewhere around the forty-five minute mark on Part 2, the piece devolves to a sequenced kick drum, which builds up into nearly twenty minutes of dance-influenced EM. The band cheerfully admit to straying into dance territory occasionally and they're not lying, although this particular (probably somewhat hidebound) listener could've done without it. in nearly two hours, the only samplotronic intervention is a flute part some twenty-eight minutes into Part 2, which, given how little of the total length it inhabits, would rate a mere half T were it applicable. 2009's Trick or Treat? consists of just one, hour-long track, starting off in ambient mode, before they pick the pace up about a third of the way through. Incidentally, this lot are serious about their improvising; watch for the bum note in the 44th minute. No samplotron whatsoever until after said bum note, with choir and string parts towards the end of the piece. As so often, though, you really have to be a serious fan of this stuff to tell most of it apart; while a perfectly competent release, this has trouble standing out from the pack. AirSculpture make no pretence at being anything other than what they are: a Berlin School EM outfit, albeit one with a slightly broader palette than many. EM will/already do love this, the rest of you will probably scratch your heads in bemusement.